Coming from a family of attorneys, Christy Lyn has wanted to be an attorney since the second grade. After graduating The Meadows School in 1996, Christy Lyn attended the University of Nevada, Las Vegas. She majored in psychology and minored in english with emphasis in communications studies. She earned her BA in 2000. Christy Lyn was then admitted to the William S. Boyd School of Law in the summer of 2000, and graduated in 2003, becoming the third graduating class of Boyd School of Law. During law school, Christy Lyn participated in the Children’s Welfare Clinic for Neglected and Abused Children. She was admitted, pursuant to SCR 49.5, for practical training in the child welfare clinic allowing her to successfully represent multiple children in Family Court. She now takes on pro bono cases involving abused and neglected children. 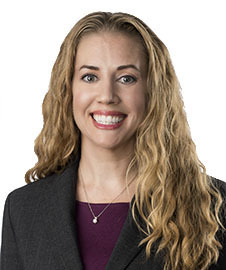 Christy Lyn’s practice focuses on general insurance defense, premises liability, medical malpractice, first party bad faith and products liability. Christy Lyn was born and raised in Las Vegas, and her entire family resides in Clark County. Christy Lyn’s family, especially her daughter Isabel, is her priority. Christy Lyn attended high school at The Meadows School from which she earned her high school diploma. During her high school academics Christy Lyn was a member of the swim team, for which she lettered. She continued on with competitive swimming after high school before retiring from the sport, competitively. Christy Lyn has been a cellist for 26 years, having played in multiple youth orchestras and symphonies. She also plays the piano. Law Clerk to the Hon. John S. McGroarty, Eighth Judicial District Court.